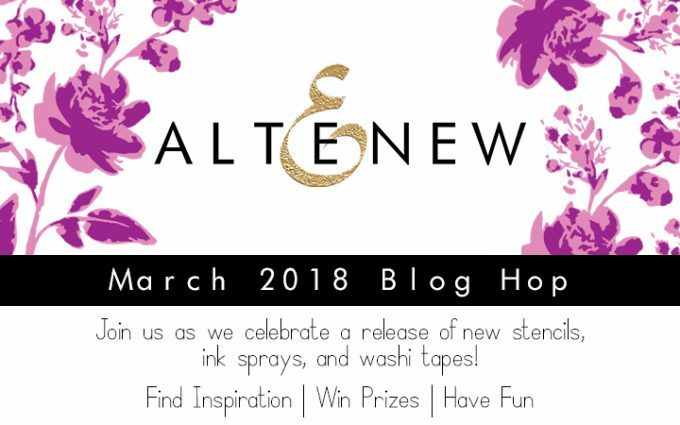 Hello and welcome to Altenew March 2018 Release Blog Hop. We are celebrating the release of new ink sprays, stencils and washi tapes! You probably came from my dear friend May Sukyong Park. If not – you may consider starting from the beginning at Altenew blog and see what other members of Altenew design team and guest designers have created. There are so many beautiful projects from talented designers. Also you on each stop you you have a chance to win a prize. I’m a big fan of Art Deco style and when I saw new Deco Wallpaper Stencil all I could think is to create an Art Deco card. Although this stencil can be used to create a completely different look. If you don’t care about Art Deco, but like geometric designs. And you may find very beautiful examples from other designers on the hop. I started by applying Nuvo Embellishment Mouse in Indian Gold through the stencil onto a Jet Black panel. This stencil has a lot of opening space. Nuvo mousse on the other hand is a bit harder to apply (comparing with for example embossing paste). You need to apply a bit more pressure with a spatula tool to spread it evenly. And doing so it’s easy to pull up stencils part and apply mousse underneath it. To prevent it from happening and get more crisp lines I sprayed the stencil with temporary spray adhesive, to it was kind of adhered to the panel while I was working with it. After the mousse dried out I trimmed the panel and adhered it onto a Jet Black card base. I die-cut letters for the sentiment out of Gold Mirror Cardstock using Inline Alpha Die Set and adhered onto a Jet Black panel. Which then was adhered onto a Gold Mirror panel of a bit bigger size, which in turn was adhered onto a big bigger Jet Black panel. That way I created this kind of gold frame around the sentiment panel. After that I foam mounted the sentiment panel onto the background panel using black foam. Several Onyx Crystals were added to accentuate a the card. For my next card I used new Watercolor Bouquet Stencil. Altenew really steps up the game when it come to layered stencils. I used this stencil to create a gold dimensional bouquet with layered Nuvo Embellishment Mouse. Indian Gold was used for the bottom layer and Cosmic Brown for the top one. 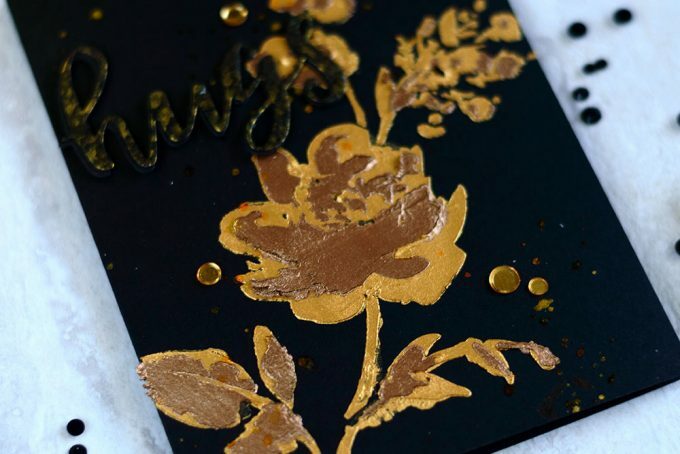 Antique Gold Ink Spray splatters were added onto the card after the mousse dried out. 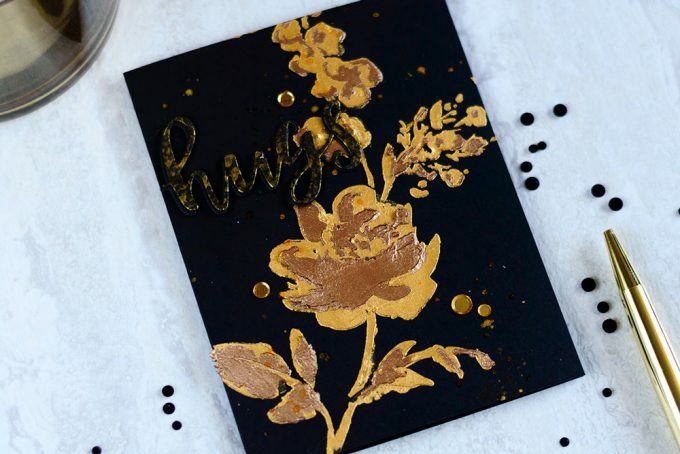 I sprayed Jet Black cardstock with Antique Gold Ink Spray, let it dry and die-cut hugs sentiment out of it using a die from Script Words Die Set. I made the same die-cut out of Jet Black cardstock and adhered two die-cuts together, with a slight shift. Next I adhered the sentiment onto the card. Some gold confetti finished off the card. Another amazing stencil that made me shiver when I saw it was Warp Speed. And of course I wanted to make a si-fi card using it. First I applied White Embossing Paste through the stencil onto a Navy panel, removed the stencil and poured Pure White Embossing Powder onto the paste. As it still was wet the powder stuck to it. I put the panel aside to let the paste dry and then heat set the powder with my heat gun. I did it to add texture and make warp speed design more solid white. After that I sprayed the panel with new Pure White Ink Spray, to add “stars”. Next I die-cut letters for WARP SPEED part of the sentiment out of Solar White Cardstock using Brush Alpha Die Set and adhered them onto the panel. And added the rest of the sentiment using stamps from Perennial Beauty and Bamboo Rose Stamp Sets. Lastly I adhered the panel onto a Solar White Card base. I will also randomly choose a winner from comments left on this post and the prize will be $30 gift certificate to Altenew online store. Please leave a comment on this post by Wednesday, March 14th at 11:59 PM EST for a chance to win. I will announce the winner here in this post on Thursday, March 15th. The winner of $30 Gift Certificate is Liliya Rytsar. The next stop in the blog hop will be amazing Nina-Marie Trapani. If you got lost, please go back to Altenew Card Blog. Love your bold and unique cards! such an unique style Svitlana and such different cards – love your bold approach to design. Hi, Wild COOL cards today, LOVE them!! I am a fan of Art Deco also, I love the Black and Gold together, big fan of those colors. Really enjoyed your post today, these stencils are awesome. Nice cards! I like that Warp Speed stencil. So many possibilities. Great ideas! Thank you for the inspiration! LOVE the Art Deco designs!!!! Such great cards all around! Thanks for sharing! Lovely new products used in new and original ways! Keep the ideas coming! All of that gold is beautiful. Especially against the black card base. I love your Art Deco card. It is beautiful ! The stencils in this release are awesome. Wow so glamorous! Loving all the shimmering goodness. Your cards are amazing ! The two gold and black cards are very elegant (the art deco card is awesome). And I love how you used the warp speed stencil for a get-well-soon card, it’s very clever ! I love the gold and black! You always share so unique and creative ideas!! 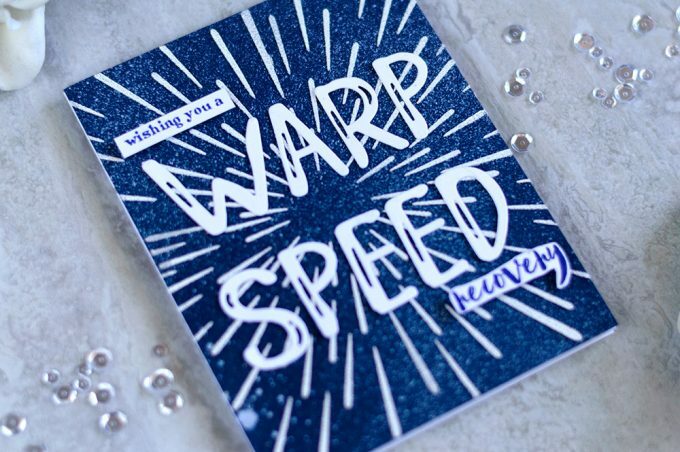 Love the warp speed recovery card! thank you for sharing! My favorite stencil is the Art Decco too!! The gold embossing paste is gorgeous! Beautiful cards! Thanks for sharing. Those colors are great together. I love the embossing on the on the poppies….never would have thought of that! Your get well card is adorable, and your Art Deco cards are stunning! Love your beautiful cards – so striking with the gold! I also love the Art Deco style. I love using black for backgrounds and yours so compliment the golds you used. The hello card is my favorite. The floral stencil using the mousse was brilliant. Love them both. Love the art deco design and the Warp Speed stencil! Looks like Mousse is going onto my list of things to buy. 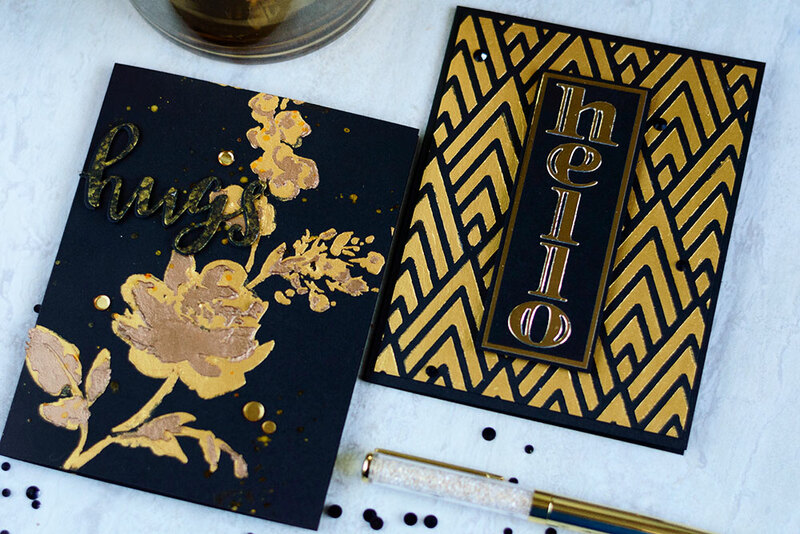 Gorgeous and elegant cards, I love the gold/black art deco look and that layered floral stencil card with all the texture is amazing. Love the warp speed card, awesome sentiment too! The last card made me smile but the first two are out of this world gorgeous! 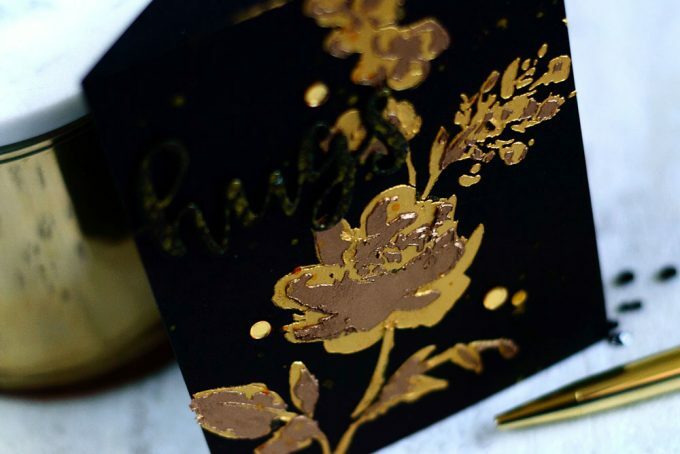 Just love the gold embossing paste, and the flower with the two tone! WOW! Just love the warp speed stencil. Very pretty cards! I love the stencils released! Your gold and black cards are so elegant and classy. Love the warp speed card too. New stencils are awesome. These are all so gorgeous!! I love the designs of each one!! Amazing inspiration!! Very nice cards! I love this new release from Altenew. So many great ideas in the blog hop, too. These are so bold and beautiful. Love the black and gold. Your black and gold cards are stunning. Fabulous cards. Thanks for the great ideas using stencils. Great ideas! I like how you used the layered stencil. Thanks for sharing. Awesome bold colors. They make for a happy card!! The art deco design caught me immediately! Great design. 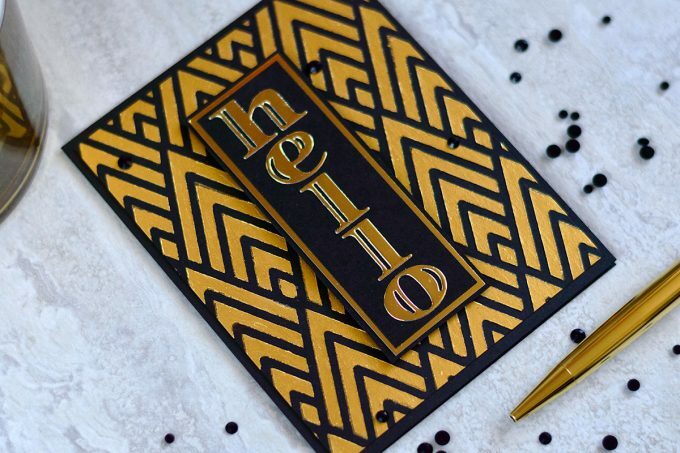 Love the art deco look with that Gold Mirror cardstock!! Love the sci-fi card, very creative. Your cards are bold and beautiful! Great cards! I love how you went from Art Deco to Sci-Fi! I think the new stencils allow for so much versatility! beautiful black and gold cards, Svitlana!!! Gorgeous cards!! The new Altenew stencils are amazing. Love your art deco cards! The use of the gold makes the cards to sumptuous! I just love gold on cards. It’s such an elegant look! Awesome cards! The gold & black combo is so elegant! Fabulous new products! Your are Wallpaper Stencil card is so rich looking. It would make the perfect masculine card for a special person. Love all your cards but that one really stands out! Love the gold and black together, thank you for sharing. Your deco art card steal my heart. It is just beautiful! I do love all of the stencils in this release. Oh my goodness !! Love the black & gold! Wow!!! Rich, elegant, graphic and textural – amazing cards! Love your cards! The gold flower is amazing! Svitlana, these are all beautiful, esp. 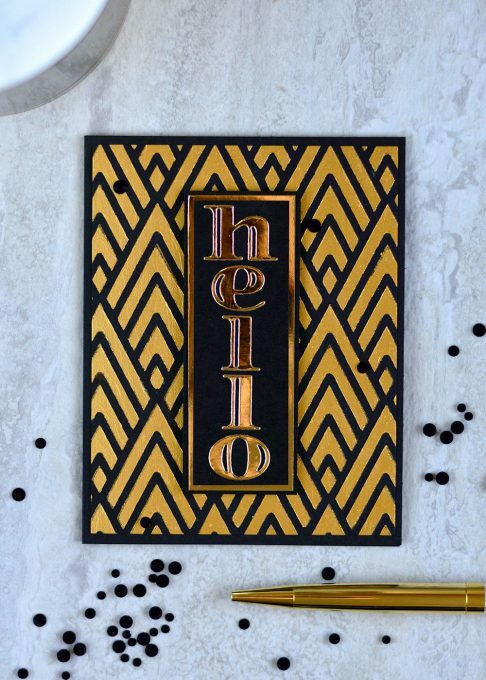 the Hello card and the stenciled flower. WOW! I love all 3 cards!!! 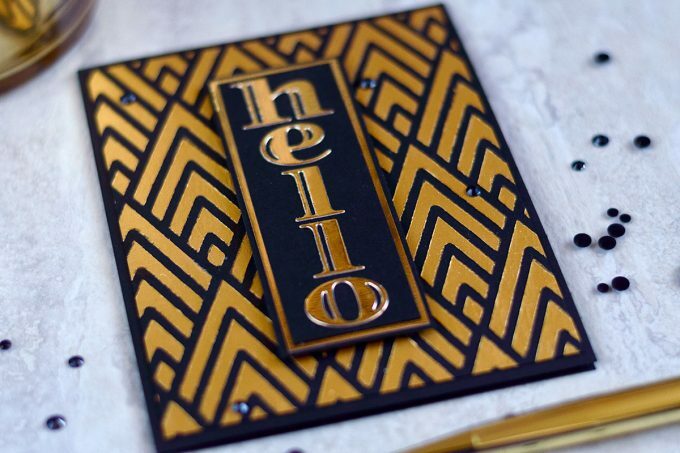 I didn’t know I liked art deco, but I am in love with your hello card!! Stunning! Gold and Black…always a classic! Love it! I would frame your gold and black cards for art work! So elegant with the black and gold and fun warp speed card. Super cool cards! The first one is my favorite! Svitlana, your creative ability is constantly amazes me when I see your work! The first “hello” card looks so elegant and formal, while the rose one feels almost organic. The final one just makes me smile with it’s whimsical feel – such a wide range in your art work. I just love it! Wow the gold and black is wonderfull. Thanks for sharing. Layered stencils are new to me, I’ve just caught up to the layered stamps! Thanks so much for sharing the techniques you used on your beautiful cards. Beautiful cards. I love these new stencils. The gold and black is very dynamic! Great cards. Great cards! I especially love the first two in gold! Anything in gold is so classy! Thanks for sharing! wow- your bold and vibrant color choices and designs are super!! An awesome new release and inspiration too! The layered mousse card is amazing! 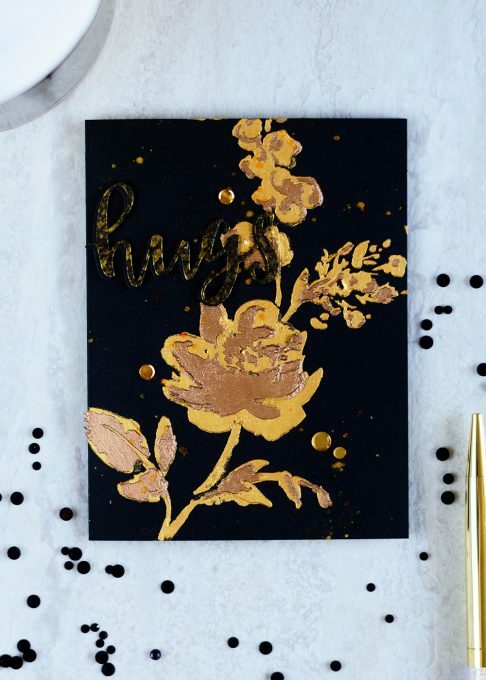 The black and gold is just so eye catching, this had been a fun blog hop. Such amazing talent and awesome new products. Those black and gold cards are just so elegant and beautiful! I love the art deco feel of the first card, and the second has almost an Asian flair. So much inspiration, Love the black and gold! Great cards. Black and gold very striking. 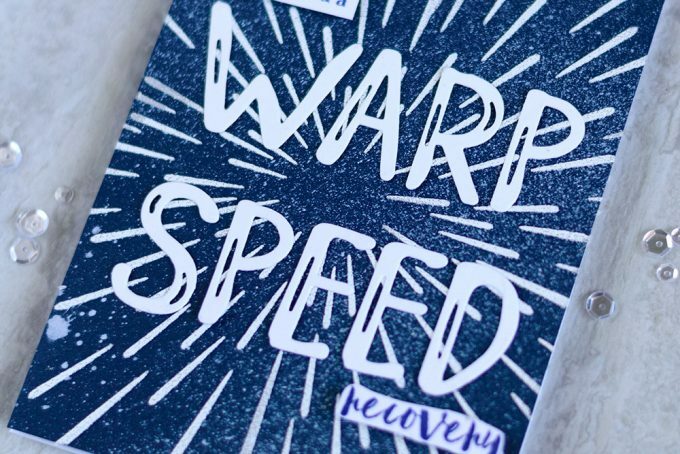 Really love the warp speed card – must give it a try. I will also have to try using the Nuvo mousse – love the texture on the art deco card. Hi there. Your cards are very different and I love that. The new Altenew March releases are fantastic and we’ll all be able to create some great projects with them. Thanks so much for sharing your talent with us. Oh, well done! Your style is completely different than the previous ones. it’s nice to see so many different ways to use the same products. I love all the stencils and your bold and amazing cards! Wow! Amazing cards! Love the 1st card the best since I am a huge fan of the Art Deco style. The new products are really fabulous. What a wonderful new line of stencils – so innovative, and love that you can use each one in different ways to achieve multiple effects. The inspiration is amazing! Such clever designs! Oh , wow this is beyond amazing.. love the flower one. 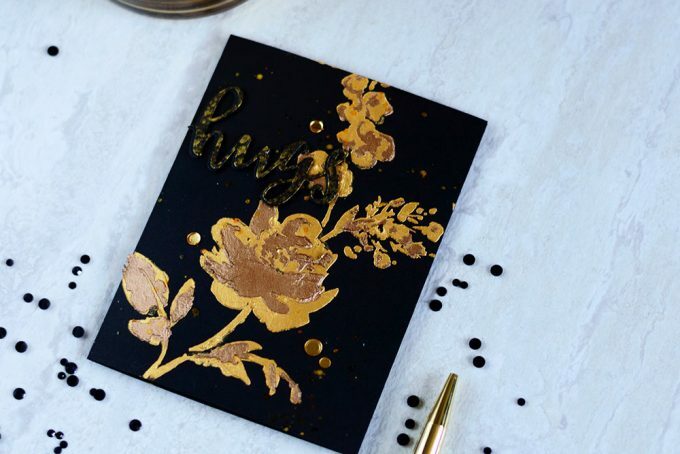 Utterly stunning cards–I love the gold on black!!! I discovered the Nuvo mouse through your projects just now! One can never go wrong with a black and gold combo!! Stunning cards, so creative and unique. Love the mousse stenciling! Given your love of Art Deco on your instagram, I thought you might use that Deco wallpaper stencil! 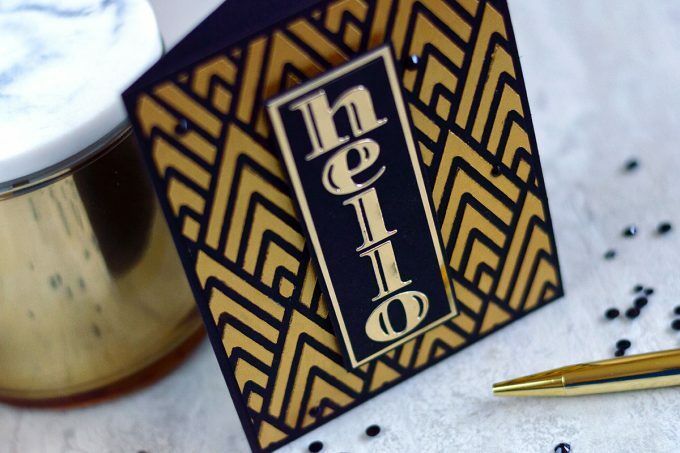 You did an amazing job getting sharp lines with the gold Nuvo embossing paste. And I wouldn’t have thought that the mousses would work on top of each other, but wow, that is a fantastic result. 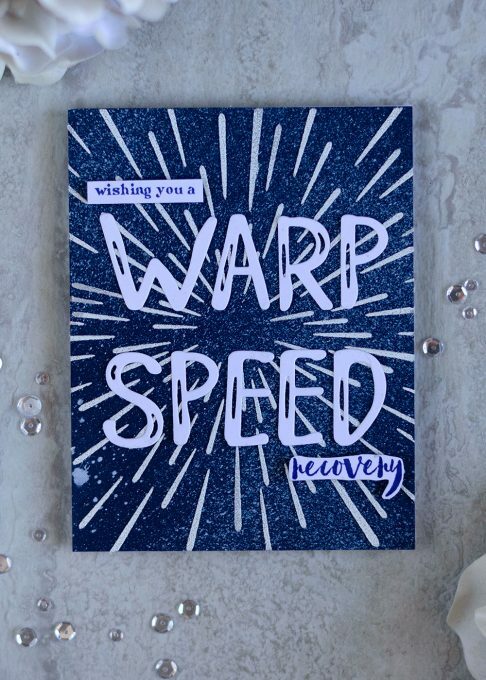 And I love how you used the warp speed stencil; I hadn’t thought of it as a get well card, but that makes so much sense! Thanks for sharing. Wow! The Indian Gold mousse against the black cs is rich and stunning! Such a gorgeous and dramatic effect! Wow love how you used the gold!! Great use of stencil and Art Deco look. The gold really makes it stand out. Thanks for sharing. I love black and gold together. That gold paper is awesome. Fun and dramatic cards. Very unique style. wow your cards are stunning!!!!! Your cards are absolutely stunning! 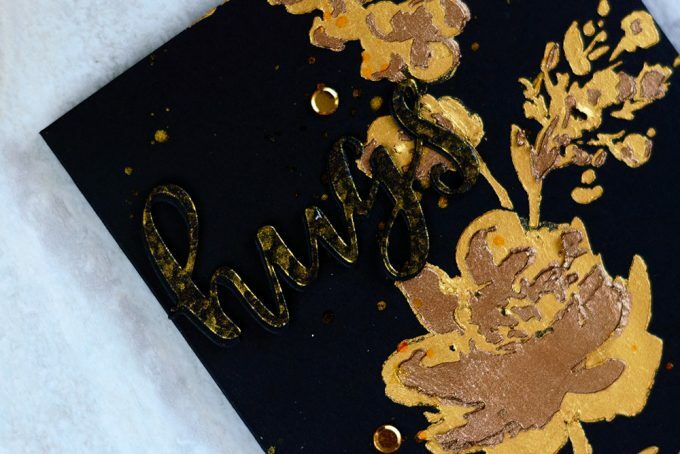 I love gold on black cards and yours are absolutely gorgeous! I saw these in my feed on FB and I just had to stop by your blog and tell how much I love them! I love the art deco card. The stencil is beautiful and the Nuvo Mousse really looks beautiful in that pattern. Your cards are bold and stunning! 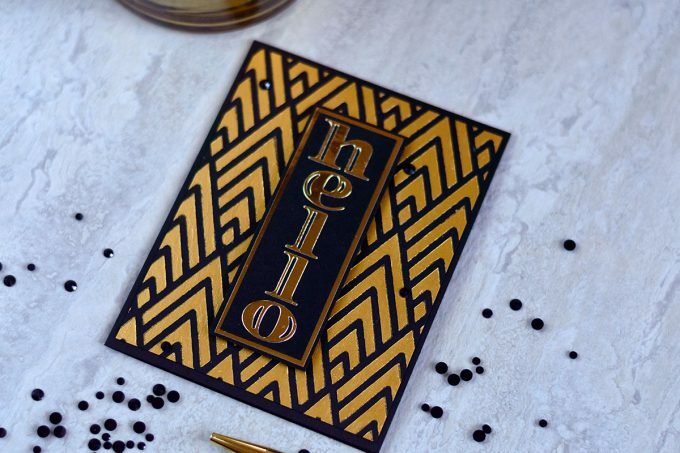 The combination of the black and gold is eye catching and unique — especially in the Art Deco card. Also like the clever warp speed get well card. Thanks for the great ideas and inspiration ! Stunning cards! Thank you for the inspiration. The gold cards are very elegant! Love the colour palettes on your cards today.